Stephanie Gillispie, artist and mother, is multi-talented in various mediums and uses her talents to add a unique twist to her illustrations. 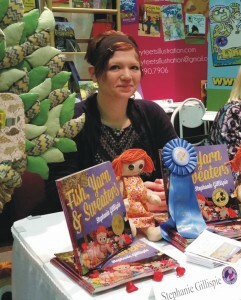 The illustrations she created for Fish, Yarn & Sweaters were made from fabric and sewing notions and will inspire children to try their hand creating art using things they have at home. Stephanie also creates murals, personal artwork, and is a photographer. Writing children’s books is a personal passion of hers. She lives in West Virginia with her family.